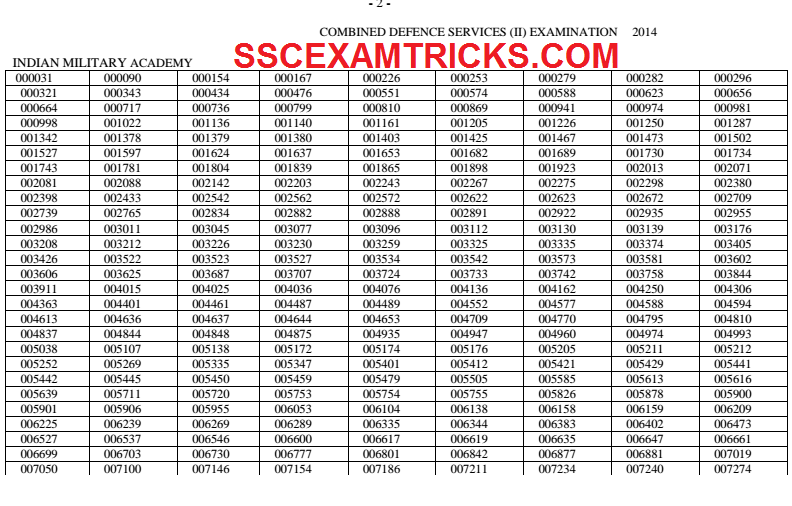 Union Public Service Commission (UPSC) has released result of UPSC CDS II Exam which was conducted on 26th October 2014 for admission to following courses for which courses will be started from July/ October 2015.
the list of short listed candidates for interview which will be conducted by Service selection Board of Ministry of Defense. A total of 8481 candidates have been short listed by UPSC. The Roll Number wise result has been released on the official website of UPSC. The short listed candidates are required to original document along with attested photocopy to their respective choice of admission in various courses before 13th May 2015 (1st August, 2015 in case of SSC only). Earlier UPSC had conducted written examination on 26th October 2014 for various posts in combined defense services in various centres in all over the country. Lakhs of candidates had applied for the posts. The Latest News is that those candidates who had appeared in CDS II Exam and check their result from the direct link which is provided in the end of the posts. The aim of Union Public Service Commission (UPSC) CDS II is to select best and suitable candidates for the various officer posts in the Indian Army. This exam is controlled by the government of India and is conducted two times i.e. June and October in every year. The selected candidates have to qualify the interview conducted by SSB after clearing the SSB and the entire medical checkup the candidates finally get selected for designation of an Indian Army Officer and join the training of the same. The selection will be done based on the performance in written examination of CDS II and intelligence in personality test of candidates. The exam was conducted on 26th December 2014. The exam was conducted on PEN MODE. Candidates were provided OMR Sheet in which candidates details and Answers were provided on this sheet. Candidates had to fill circles by Blue/Black Ball Point Pen. Answers were provided in four options in which candidate had to choose one as correct Answer. The Exam was a multiple choice question (MCQ). Four question set of Question papers A B C and D was provided to candidates in the exam. Written exam contained three subjects viz. English, General Knowledge and Elementary Mathematics each of 100 marks was conducted for duration of 2hrs for each exam. Written exam consisted of two subjects viz. English and General Knowledge each of 100 marks was conducted for duration of 2 hours to each subjects. Candidates can download these answer keys of All Sets A B C and D from the official website mention in the end of the post. Short listed candidates of written examination are called for 2nd stage which is an Intelligence and Personality Test to be conducted by SSB. Call Letters to the short listed candidate for Intelligence and Personality Test (Interview) will be sent by post/courier/email or online on the official website at the correspondence address mentioned in the online application submitted by the candidate. The Service Selection Board (SSB) arranges intelligence and personality test to bring out the presence/absence of Officer Like Qualities and their trainability in a candidate by IO, GTO and Psychology Test. The Intelligence and Personality Test procedure consists of two stage Selection process-stage I and stage-II. Only those candidates who clear the stage I are permitted to appear for stage II. Stage I - Officer Intelligence Rating (OIR) tests- In this test candidate’s ability is checked by Picture Perception (PP) analysis. It also contains *Description Test (PP&DT). The candidates will be shortlisted based on combination of performance in OIR Test and PP and DT. Stage II- Interview, Group Testing Officer Tasks, Psychology Tests and the Conference. These tests are conducted over 4 days. The personality of the candidates will be assessed by the interviewing Officer (IO), Group Testing Officer (GTO) and the Psychologist. There are no separate weightage will be provided for each test. Candidates are required to submit their original document along with photocopy of document as their First choice of Admission in Courses. These documents are required to submit within 2 weeks after the announcement of Final Result of UPSC CDS II. For more information / query/ clarification regarding examination candidates may contact on working day between 10 am to 5 pm or on over telephone No.011-23385271, 011-23381125 and 011-23098543 from Facilitation Counter organized by UPSC.